Lacquer Lockdown: Hot Off The Stamping Press: UberChic Beauty Christmas 02 & UberSwatcher! 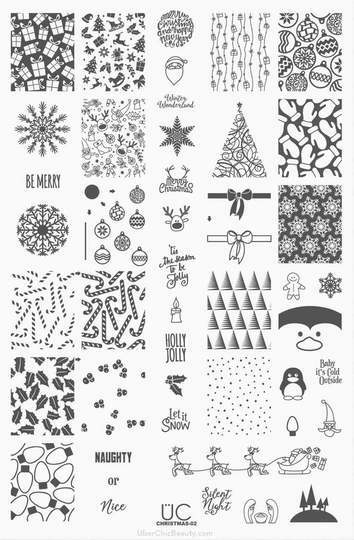 Hot Off The Stamping Press: UberChic Beauty Christmas 02 & UberSwatcher! Last one and finally finally I am caught up with all the UberChic Beauty releases - yay! This time is the Holiday 2016 edition of the UberChic releases and I'm super excited to share last weeks release with you since Brittany always does such amazing things with her holiday plates. Let's go! The original Christmas 01. I think the UC holiday plates are all really special and worth picking up so go get em before the season starts so you can spread out the magic. That's my plan at least! Now let's talk about stocking stuffers! I am in the process of putting together my nail art area in my apartment so they could not have been more timely. Just as I ordered some Helmers these released. Now I'm going to try and save up and get many. The downside is a bundle of 100 of these ingenious little creations is about 100 bucks ($98.89). Why does that matter? Well a Helmer holds about 500 polishes. I don't really want to spend that much across an entire polish collection that spans roughly more than 2000 polishes. I'd have to spend that much to swatch my entire collection so I'm pretty torn. Decisions decisions :/ Not sure how to work this one out but these little swatching caps are amazing especially for those of us who are true addicts of nail polish as much as we are plates! As usual Brittany has outdone herself while creating something that every little nail polish lover would grow to love and need! You can find the plates as well as the swatchers above on the UberChic Beauty website. Individual plates retail for $14.99 USD. Swatchers vary in price depending on the amount you buy. Happy hunting and I'll see you next post!